For months, my girls have been planning their own cupcake shops. My 8 year old is incredibly detail oriented, and very persistent and determined to someday own her own store. It all started when she discovered the show "Cupcake Wars." She recently watched the American Girl movie, Grace, and realized that more specifically, a French bakery, or a "Patisserie" was what she wanted. She researches cupcake recipes, copies them down in her many journals, and has even baked a few batches for Ben's work office. I want my children to be entrepreneurial. I want them to be creative, and I want my them to know that going to college is not the only way to make a great life for themselves. 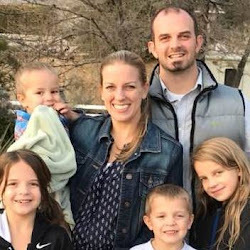 They each have unique skills, and I want to help them develop those skills and know that they can turn their skills and passions into income sources if they so desire. And with that, I created the "Create Your Own Cupcake Business" printable packet. My girls have been hard at work planning their newest cupcake shop. The packet helps guide them through some of the various aspects of starting a cupcake business. Designing a logo, naming their store, thinking through where they'll advertise, designing a menu, and more, are part of this packet. It's simple, but can easily be expanded upon. My girls will end their planning process by putting all their info and designs onto a trifold presentation board, baking a batch of cupcakes, and giving a presentation on their store to the family. I want to encourage my children's creativity and passions in any way possible. I want them to know I believe in them, that they can succeed, and that their ideas are valuable and unique. I have made these printables available to homeschoolers and teachers alike via my Teachers Pay Teachers store. The packet is just $1.99, and gives you access to the 15 pages of guided planning! 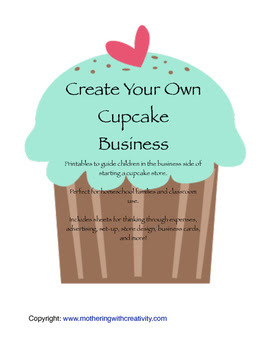 You will find planning pages, "task" pages, and others designed to inspire your child to create their own cupcake shop!